"The view begins nowhere and ends nowhere. It is infinite, mountains beyond mountains." 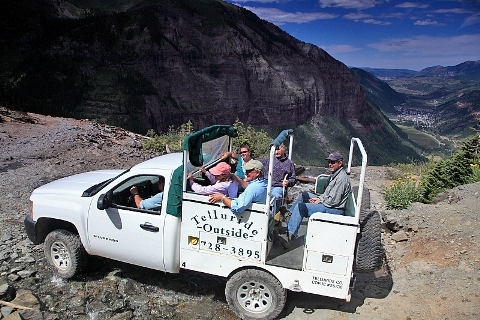 Telluride Outside's 4-WD Tours provide an unparalleled opportunity to experience Telluride's fabulous high country while learning the history of one of the world's most famous and notorious gold rush towns.Our tours emphasize scenery and mining history. The routes are inherently "4-WD" in nature, because we're traveling on old mining roads that were etched in the San Juan Mountains a hundred years ago, but the emphasis does not fall on "rock crawling" and technical manuevering as it commonly does on desert country red rock tours. 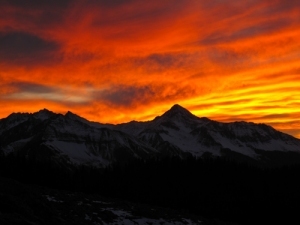 Telluride is among the most naturally gifted high country areas on earth. Traveling into these mountains combines thrilling adventure, fascinating mining history and once-in-a-lifetime scenery. Our "Jeep" tours are actually conducted in new model Chevy trucks customized for your safety, comfort and optimal viewing. Seats are heavily padded, suspension is beefed up and the cab is open so you may converse directly with your guide. Removable canopies provide shelter in all weather conditions without inhibiting the "open air" experience. Nautical grade clear plastic windows are stored in a hatch, so if the weather does turn foul, your guide may zip them on for your protection. 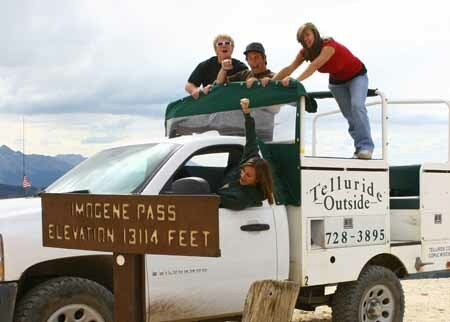 Telluride Outside is one of few tour companies in the Rockies (possibly the only company) that runs new model vehicles rather than converted 1980's era SUVs, older model Jeeps or 30-year-old European military vehicles. This is just part of Telluride Outside's commitment to highest quality tours. 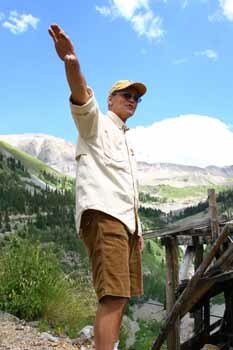 We honestly believe there is no finer group of tour guides than the professional staff of Telluride Outside. These guys are so knowledgeable and people-friendly that they could entertain you for a whole tour without ever leaving Telluride. Each of our guides brings personal touch and style to a tour. They share in common professional offroad driving skills, a love of Telluride's flora, fauna, mountains and mining history, and the born-with-it nature to be the consumate host. Our staff includes experts in geology, herbology, and even direct descendents of turn-of-the-century miners. They are fun-loving professionals, committed to your comfort and enjoyment of the tour. Imogene Pass climbs Tomboy Road from downtown Telluride to a summit of over 13,100 feet. Our half day trip to Imogene via the Tomboy Ghost Town is our single most popular tour, generally available from late June through September. Tomboy Road is an intermediate 4-WD road, bumpy and airy, but not as tricky as Black Bear Pass or other truly advanced routes. This is a well-suited trip for most customers. Kids, seniors and everyone in between enjoy the thrill of high country adventure and the colorful history of Telluride's most famous gold mine: Tomboy. In addition to Tomboy, tour highlights include the "Social Tunnel," the summit of Imogene and the Red Mountain Overlook, which offers astounding views of the towering Weminuche Mountains to the east. Full day trips cross Imogene Pass into Ouray and return via Ophir Pass or Black Bear Pass. Half day tours (most popular) visit the summit (snowpack permitting) and return to Telluride on Tomboy Road. Ophir Pass is our favorite early-season tour because snow generally melts off the pass about one month before Imogene Pass. Ophir Pass is well-suited to less experienced offroad travelers and those who seek the beauty of the high country in combination with a shorter 4-WD driving experience. The pass road does include some classic "shelf road" sections with stunning views and the necessesity of 4-WD manuevering. 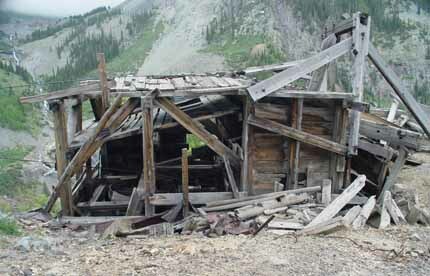 We normally also visit the Alta Ghost Town on this tour, a 4-mile excursion up a nearby 4-WD road (easy) to the famous Alta townsite. Alta is one of the best-preserved ghost towns in Colorado and the site of a classic post card photo opportunity: Wilson Peak as viewed from Alta. During the gold rush, Alta became the first town in the world to utilize the modern technology of alternating current electricity. You'll learn about this and many other significant facts tracing their history to this erie, abandoned townsite. As a bonus, our Ophir/Alta tour offers Telluride's best wildflower viewing in July and early August. One of Colorado's most notorious offroad passes, Black Bear is recommended for thrill seekers and experienced 4-WD travelers. We primarily tour Black Bear as a half day morning trip to avoid exposure to rain storms on slow-driving sections above treeline. The tour begins by crossing Ophir Pass and driving north on Highway 550 to the beginning of one-way Black Bear Pass near the summit of Red Mountain Pass. After climbing the back side of Black Bear, we summit the pass and drop into Black Bear Basin, where wildflowers grow waist-high in the late summer. We then descend Black Bear's famous "stair steps," cross under Ingram Falls, and descend the breathtaking "switchbacks" of Telluride's box canyon headwall. The road becomes two-way at the top of Bridal Veil Falls, Colorado's highest waterfall (464 feet). We view Bridal Veil from many angles as we descend the lower road, including an amazing straight-up view from the mist plume itself. Total tour time is approximately 4 hours. Black Bear is generally open from mid-July through mid-September. 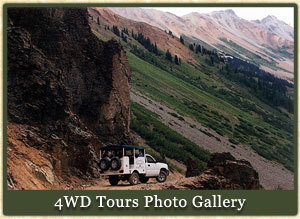 Enjoy the magnificent San Juan Mountains on a Telluride Outside sunset 4-WD tour. Potential destinations for our evening trips include the Alta Ghost Town, Tomboy Mine, Bridal Veil Falls and Last Dollar Road. All catch the spectacular light of sunset and each offers fascinating highlights in mining history and alpine scenery. Our sunset tours are ideal for those who are spellbound by alpenglow in the high country and also for families who seek a 4-WD tour of somewhat shorter than our standard half day tours.